Losing a limb is a life-changing experience. For Scott Poindexter it also was the start of a career. 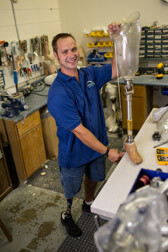 Scott is the lead orthotic and prosthetic technician here at Powell. He’s the one fabricating and adjusting replacement and supportive products to meet the needs of our patients. 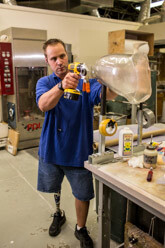 He became an above-the-knee amputee in 1998 following a car accident while in high school. After his accident, Scott didn’t know where his life would take him. “I was still in school and had to get up every morning but I didn’t know if I could get a job. Life was turned upside down,” he says. It took some time after being fitted with a prosthesis but once he mastered it, he said bye-bye to his wheelchair. To gain credits for school, he volunteered at a prosthetics office and eventually began employed laminating sockets and shaping coverings. He liked it so much he dedicate his life to helping others regain their mobility. Now, with 10 years at Powell, Scott is in a unique position as both a technical expert and as someone who has been there. To learn more about orthotics and prosthetics at Powell, please contact our office at 804-649-9043 or check out our website at www.powelloandp.com.